It’s that time of year again here in the Midwest and elsewhere… hard, frozen ground exascerbates the impact on the horse’s limbs, joints and hooves with every step. During bodywork sessions in the winter, I find a lot more soreness in the muscles supporting and balancing the front limbs, in particular. While we cannot change the fact that the ground is hard and frozen, we can support our horses in maintaining flexibility in their natural ‘shock absorbing’ mechanisms by releasing tension in front limbs and shoulders. Here a few ‘no fail’ exercises you can do with your horse. During the winter months, I often find the ascending pectorals—the muscles passing right under the horse’s girth line behind the elbow—especially reactive, compared to the warmer seasons. This particular area is also known as ‘the foot point’, since reactivity in the ascending pectorals often points to discomfort in the front limb or foot. These muscles—part of the horse’s intricate system of front limb and shoulder attachment to the body—are responsible for balancing the horse’s front limb and can get sore if the horse tries to avoid discomfort. As balancing across hard and frozen ground is a fact of life for horses here in the Midwest, I have come to accept this. However, there is something we can do to help our horses be more comfortable and to keep the horse’s shoulder appartus—it’s “shock absorber”, if you will—as functional as possible. Don’t pull, let the horse drop the leg and shoulder! Once your horse has dropped his leg on that spot, encourage him to stay in this position a bit longer by gently stroking the leg. Again – dont’ pull!! If the horse pulls away, go with him, then gently ask again. Look for relaxation and release down, this is NOT a stretch. What this does: The horse releases tension in the shoulder apparatus and thus gains improved “shock absorber” function. This is an easy exercise, once you get the feel for it. For those of you, who are interested in learning more about this particular exercise or other Masterson Method exercises, I recommend Jim Masterson’s book “Beyond Horse Massage” or his new DVD with the same title. Hold your horse’s hoof up as if you were to clean it. Keep holding it, gently moving with the horse, if he resists, until your horse relaxes the hoof in your hand. 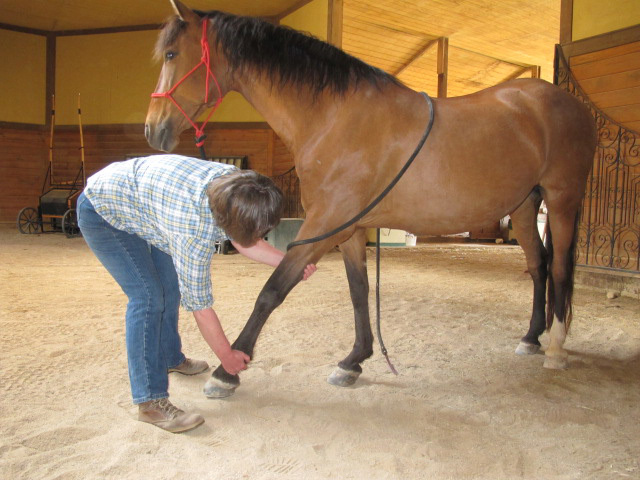 Then gently wiggle and rotate within the natural range of motion of fetlock and knee joints. Do this for a minute or two—all the while in a relaxed state—then gently place the hoof on the ground. What this does: Releases tension in functional elements of the front limb (muscles, tendons, ligaments) and thus eases strain on the structural elements (joints, bones). Clean your horse’s hoof daily, especially if he is shot. Ice buildup can cause discomfort. For the shod horse, discuss ‘winter options’ with your farrier. 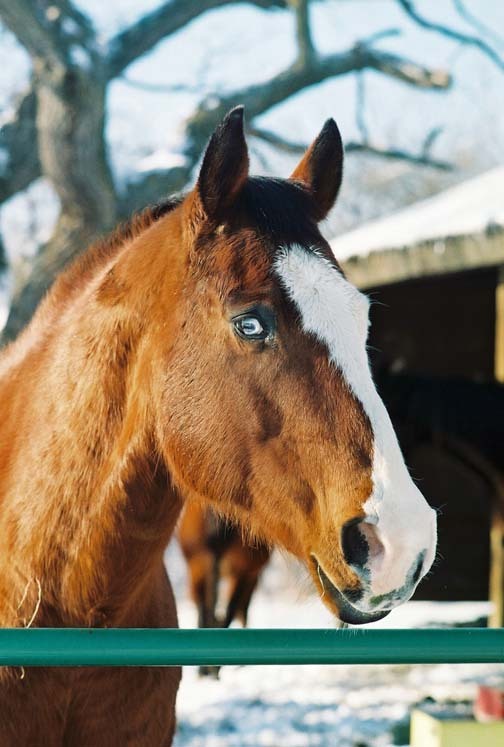 When riding in snow, consider wrapping your horse’s legs to avoid irritation from harsh snow and having him wear boots instead of shoes in the winter (for example “Easy Boots”). Your farrier will be able to advise you on fit and model. Enjoy your horse and enjoy your winter activities! ← My Horse Has Windpuffs: A Problem or just Unsightly? Thanks for this, Stephanie. Good to see you back at it. I always enjoy the great example photos you include to show how it’s done. Interesting on the high tension for low limb areas of the horse. How about a follow-up on back-end issues with the horse? While the front end of equines is where we see most issues here in the winter too, I suspect the issue with some of the horses is actually coming from behind.